The Kiki Raina Tahiti Fete is hosted by Rebecca Ka’awela Manandic, who was born and raised on the island of Oahu. After having moved to the Merced area in 1974, she began a small Polynesian dance troupe, Ke Anuenue (Hawaiian: “The Rainbow), which was the first such group in the Central Valley. At the time, there existed a Tahitian dance competition in California’s Bay Area, called the San Francisco Tahiti Fete, held at Fort Mason and run by master kumu hula, Joseph Kahaulelio. A relatively new group, Manandic’s performers were eager to begin to develop their skills by participating in the soloist category of this venue, but they were daunted by the competition, which consisted of experienced dancers with years of performance under their belts. At the event, the advanced performers quickly dominated. Upon returning home, Manandic felt that her students were deprived of the opportunity to perform their skills in a less stressful environment alongside people of comparable experience. Seeking a way to enable her young dancers to gain a level of comfort competing, she created her own “mock” competition solely for her troupe, allowing them to benefit from valuable competition experience while simultaneously helping to introduce the Central Valley of California to Polynesian culture and dance. The first Kiki Raina Tahiti Fete was held in 1979 at the APC Hall in Atwater, California, a town which borders Merced. The fete was only a one-day soloist competition, where friends and family were invited to watch their loved ones compete. The dancers were separated by the categories of gender, tane for male and vahine for female, and grouped in age categories: tamari’i for children 12 and under, Junior for 13-18, Senior for 19-34, and Masters for 35 and over. Contestants were scored in respect to costuming, execution and precision of movements, transitions, as well as the entrance and exit. Winners were awarded trophies. Although this first fete was meant to only be held once, the support from the community combined with the encouraging atmosphere it provided for the dancers pushed this event into an annual celebration. Noting the benefits of this “mini fete,” other troupes quickly expressed a desire to enter so that their students could partake in the same welcoming atmosphere. Initially Manandic and her group worried that the inclusion of outside troupes would create a more competitive atmosphere, which would be antithetical to the original purpose. Ultimately though, it was decided that even with a few other troupes, the event would still be comparatively small and capable of staying within the parameters of the original goal. In addition, Manandic and her event coordinators believed that the inclusion of these other young troupes would serve to further introduce the culture to the area. The festival, however, expanded at a rapid rate, and by 1981 it grew too large for the APC Hall and was relocated to the Turlock Fairgrounds in Stanislaus County, CA, which is approximately 25 miles away from Merced. The festival remained there for the next thirteen years. During this period, the fete became a phenomenal success, attracting participants and viewers from all areas. Its growth was unexpected and proved to be anathema to the initial premise. If things were to continue as they had been, this event was poised to create the same problems to neophyte dance groups that the now defunct San Francisco Tahiti Fete once posed. As a result of the growth, many beginner dancers were already proving reluctant to return. To resolve this problem, a beginner category was introduced, allowing for a division between newer dancers and advanced ones. Dancers may enter in the beginner category their first year competing, and if they do not place that year, they may re-enter in the beginner category the following year. Each performer is only allowed a maximum of two years as a beginner. This enabled advanced/professional performers to compete at a higher level and truly challenge their capabilities, while at the same time allowing beginner/intermediate dancers to gain experience and be rewarded for their progress. Although the event was thriving in Turlock, which was initially convenient for Manandic as she was living near the area, her eventual relocation to Merced and the difficulty involved with coordinating transportation for volunteers caused her to move the event to Merced in 1994. This move had the added benefit of increasing tourism to the Merced community, supporting the local economy, which has become another defining attribute of the festival. The 16th anniversary competition, held at East Campus High School, marked the first year that the Kiki Raina Tahiti Fete was held in Merced City. For the next nine years, the Kiki Raina Tahiti fete alternated between the various high schools in the area, and in 2003, the competition was moved to the Merced County Fairgrounds and has remained there ever since. Participants from around the country continue to attend the festival to build self-esteem and train for the sake of improving basic skills, whether through competing in individual solos or through group performances. 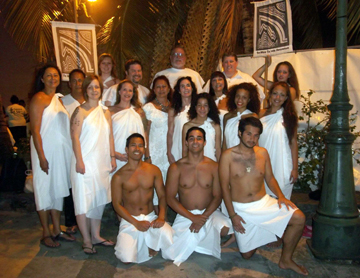 On a broader framework, however, this festival serves as a central node in a network of performances that have revitalized, disseminated, standardized, and consciously altered a nearly extinct cultural form while simultaneously presenting it in a way that wins the approbation of the Tahitian government. Crucial in ensuring the success of the festival and in carrying out these unstated objectives are the expert judges.